That quote is not only fitting for this post, but for what's been going on too. I promise I haven't forgotten about you! 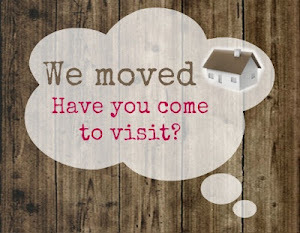 I just haven't been home or around internet to blog. However, I thought I'd jump right back into it with a super sweet post! A little while ago, I received this perfectly wrapped box of chocolates from Belgian Delights. 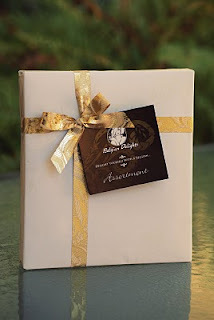 I carefully unwrapped the box to what I thought was twelve gorgeous chocolates. and began to dissect the chocolates. It's an extremely technical activity. 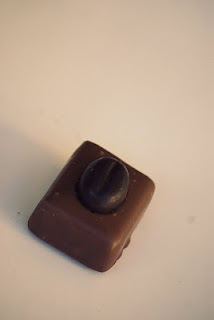 The first of the chocolates I tried was the Heart Caramel. A super rich dark chocolate shell with a gooey caramel centre.. 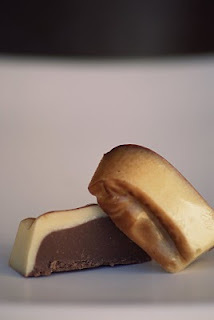 I'm a biggggg caramel/chocolate fan and this caramel was almost butterscotch like. 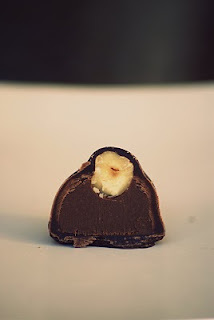 with a nutty hazelnut praline and croquant inside. which became an instant favourite with its smooth marbled praline. Hazelnut + Chocolate = Heaven. 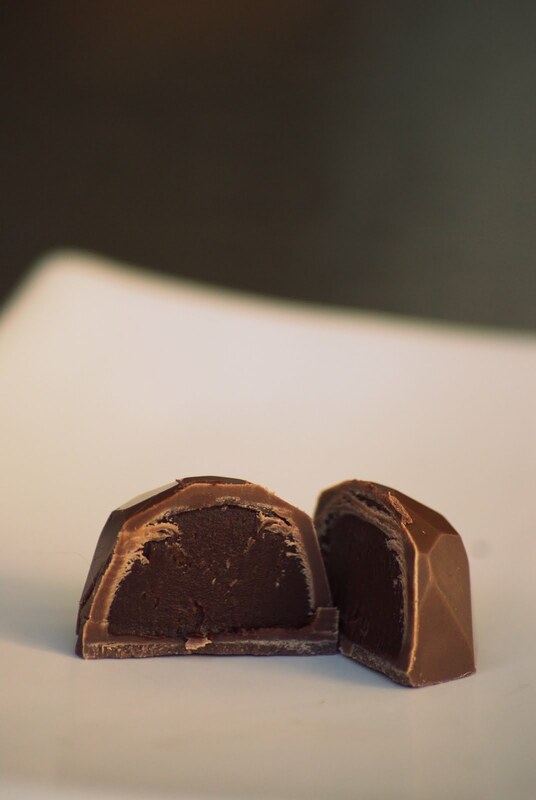 a dark chocolate that held a creamy praline filling topped with a hazelnut. a rich coffee buttercream enrobed in super smooth milk chocolate, topped with a coffee bean. I'm no coffee fan, but my caffeine junkie taste testers loved this. a white chocolate with coffee flavoured marzipan and walnut pieces. We found this had an almost fruity, coconutty taste. But that may have been the chocolate overload on our taste buds. 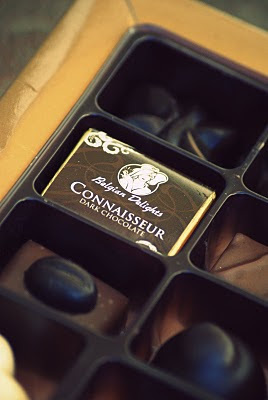 These milk and dark chocolate squares made up the fourteen chocolates, hidden under another square. 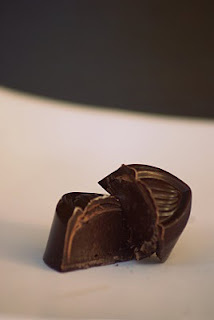 I loved the simplicity of these chocolates, it was a nice break from the intense flavours. I would've loved a white chocolate square though! a brandy and coffee flavoured ganache. with a light and fruity mango ganache filling. 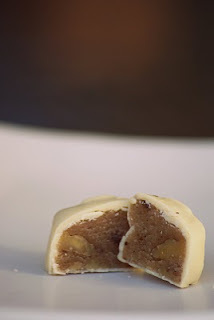 nutty praline filling topped with a crunchy hazelnut. 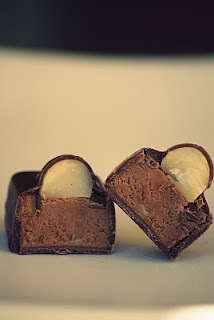 were the Horse Marble Praline and the Heart Croquant. 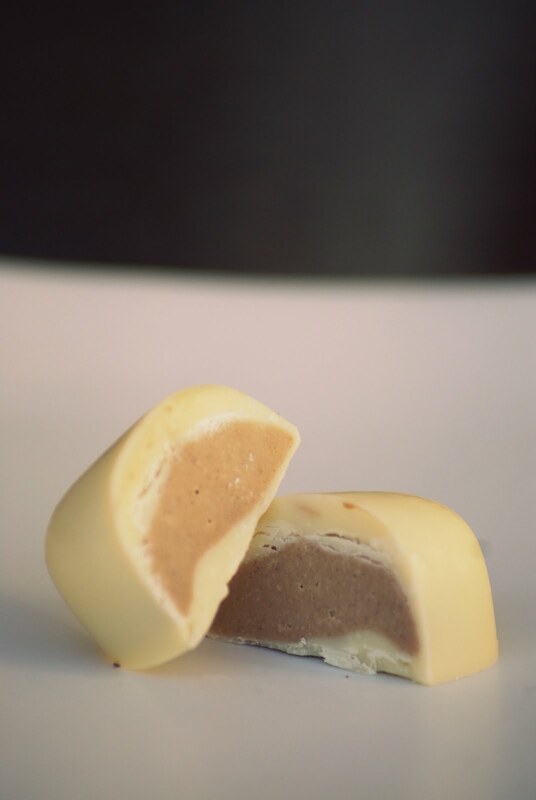 The white chocolate was super smooth and not overly sweet. But all of the chocolates had great flavours! Good enough to score an 8/10! 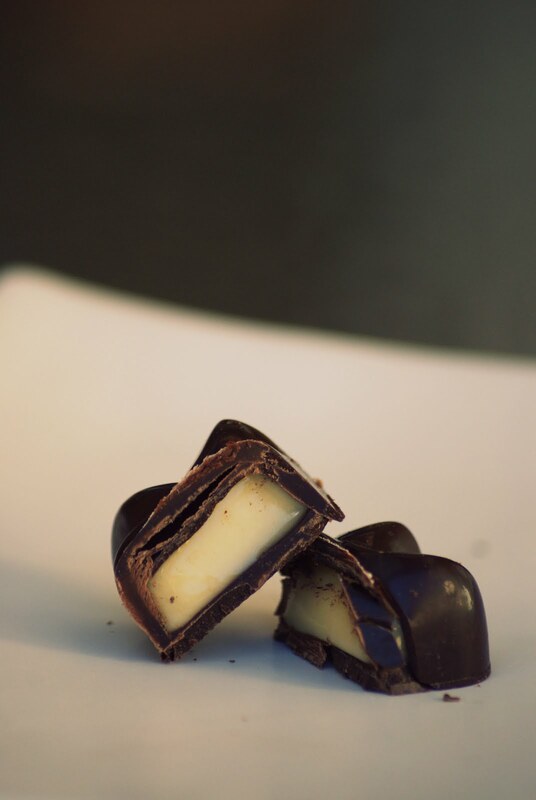 What's your dream chocolate combination?! 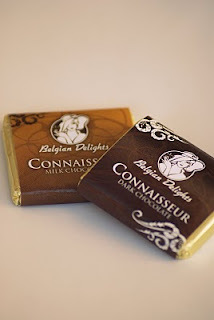 Kristy received Belgian Delights chocolates courtesy of Belgian Delights. 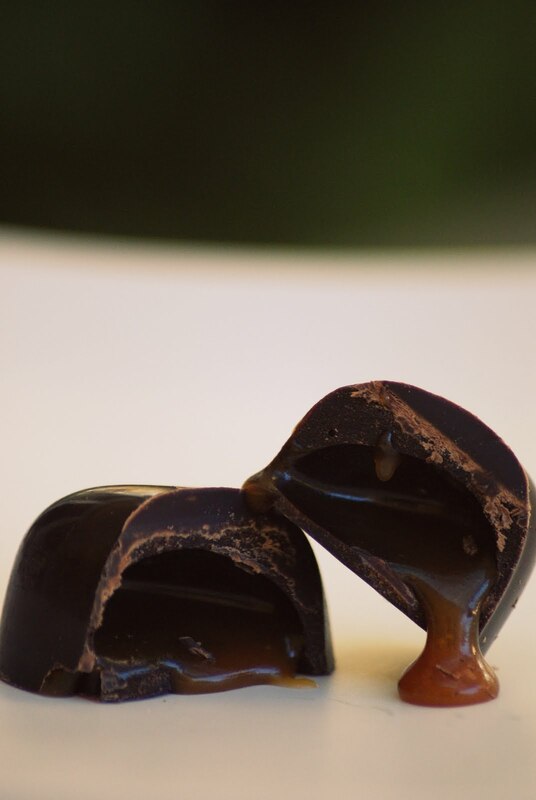 I love all the shots, but my personal fave is the shot of the caramel heart - not that I'm crazy about caramel, but it's almost like I can taste it! Beautiful series! And my dream chocolate combo is almonds and lemon - the Lindt version. mmmmm! Nice shots :) love the one with the caramel oozing out.. MMmmm! oh yum. these look great! i love that quote from Forrest Gump hehe i think i've used that one many times in passing conversation. those chocolate are making me hungry now :-) i like how you've dissected them all to show what they're like inside.